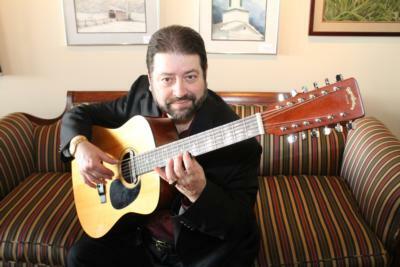 Come hear why Guitarra Magazine reviewed my playing in the following way "...executing flawless shifts with purity of tone" and why I am a perferred vender at the Country Cottage Wedding Resort. 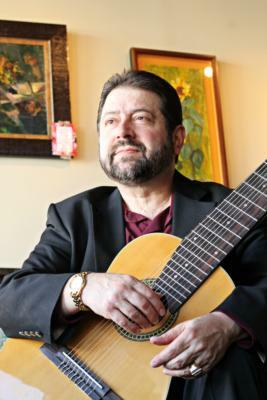 See (and hear) why I was the Geneva Guitar Competition winner and guest solo artist with the Alliance Symphony Orchestra, by taking advantage of a FREE Consultation. I will perform any number of wonderful pieces from the 60's, 70's or 80's, and/or be happy to learn any new song that might have special meaning for you or your occasion ! Maybe you would like the elegant sounds of a hand made classical-guitar (see picture) for a champagne reception; or perhaps the crisp "music box" quality of a 12 string acoustic-electric guitar (see picture). 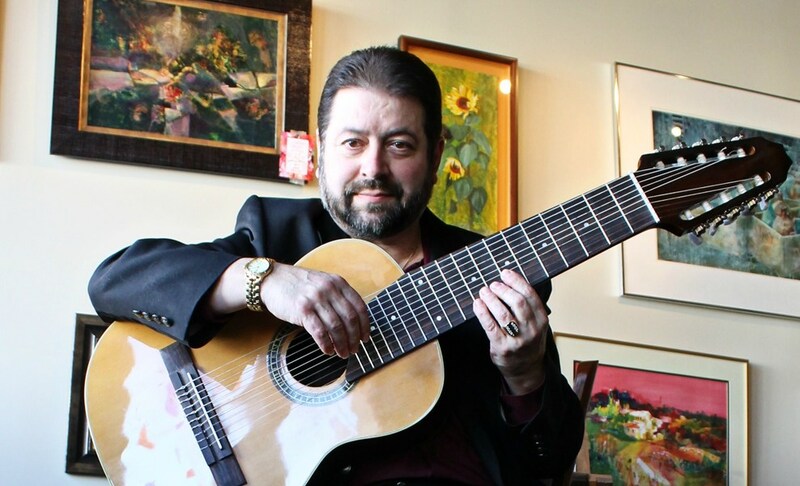 On the other hand, maybe you are fond of the past and are looking for a Renaisance mood which can be accomplished with my 10 string classical guitar (see picture) playing authentic lute music. For those of you with an ethnic flare, I can offer the firey sounds of a flamenco guitar (see picture) or soft Brazilian lullabies. Denny was fantastic. He added a special touch to our party by playing just the right music and the right time. He was attuned to what was going on during the event and adjusted his style and volume accordingly so that it fit the need and didn't over power. His music was beautiful and I would recommend him to anyone. Denny was amazing to work with! We asked him to play acoustic guitar for our outdoor wedding ceremony on September 6, 2015, after viewing some of his videos on YouTube. We were looking for someone who was willing to learn a song that is special to us but isn't normally performed on guitar, in addition to playing pretty music for our guests before the ceremony began. Not only did Denny learn our song, he played it and every song beautifully! He is extremely professional and great with communication. We live in Wisconsin and planned our Ohio wedding remotely; he completely put our minds at ease. He made our wedding ceremony very personable. I highly recommend him!!! Denny was a pure delight both to work with and to hear perform. He mesmerized our guests with flamenco music which truly added so much to our internationally themed event. We will definitely use Denny again when a guitarist is needed! Thank you so much! Denny's music was perfect for our wedding in a small, intimate location - very classy and beautiful, but never intruding on the social interaction in the room. Also, our wedding turned out to be during a blizzard with times of white-out conditions - Denny drove through that and arrived on time - amazing! Finally, he has a very gentle and quiet spirit - a pleasure to work with him. I surprised my wife on our 10th anniversary with a vow renewal. I booked Denny through Gigmasters and corresponded via text and on the phone. Having not ever met him or heard him play, I had to put a lot of trust in him........he did not disappoint. His music was perfect, and absolutely made the occasion. I cannot wait to see the video to be able to enjoy it all over. I would recommend him to anyone. Thanks a million Denny. I found Denny through gigmasters and he provided the music for my wedding ceremony. The wedding was during the holiday season so he played both traditional and Christmas songs. I met him prior to the wedding to go over some of the details, but I was happy that he was able to take the reigns and he did a fantastic job. I didn't have any specific idea what I wanted but he made a few great recommendations and I received wonderful feedback from guests. I wouldn't hesitate to recommend him to a friend! He was extremely accommodating and kind to us. He also played our special song beautifully. I would definitely recommend him to anyone! Denny is extremely professional and talented. We was willing to try and learn anything we wanted. We received many compliments from our wedding guests on the ceremony music - everyone loved it. I would definitely hire Denny again! Denny and Kevin performed for our May 2012 wedding, and we would recommend them to anyone without hesitation. Denny, the guitarist, and Kevin, the accompanying vocalist, are professional, flexible, fun and very talented. Multiple people came up to me after the wedding to tell me how much they enjoyed the music. I (the bride) was really impressed with their efforts to make the music for our wedding day personalized and special. They met with me multiple times and even took the time to learn a song I wanted to use for the wedding procession. These guys are true gems hidden in a sleepy little part of Ohio, and you'll be glad you booked them. Denny was more then what we expected. He arranged/learned a new song for us. He played absolutly beaitufully. Everyone commented on how great he was. I would hire Denny again if ever needed. He was amazing. Please note Denny Vlahos, Guitarist will also travel to Canton, Dennison, Green, Sherrodsville, Uhrichsville, Greentown, New Philadelphia, Bowerston, Kidron, Middlebranch, Mount Eaton, Sandyville, Gnadenhutten, Zoar, Dellroy, Dover, Winesburg, Mineral City, Mount Hope, Robertsville.